I don't know how many head-of-state nut cases arrived in New York for the annual meetings of the United Nations General Assembly. But surely there are many others besides Mahmoud Ahmadinejad and Muamar Gaddafi. There is a class of rulers from Africa, for example, who govern recklessly in behalf of themselves but under the cover of one or another form of millenarianism. (The brutal clowns of South America are a bit different. They still believe that Fidel Castro is a model for building the good society.) This is, I suppose, the revenge of ideology over the London School of Economics. Two of the worst dictators on the African continent could not come. Omar al-Bashir of Sudan might be detained on standing orders of the International Court of Justice. Robert Mugabe of Zimbabwe is barred from travel to the U.S., except for visits to the U.N. I suspect that he just does not want to compete with two more odious tyrants. Not more murderous, mind you, but more odious. Some day the Lord's Resistance Army will ascend to power in one or another country, and its commander will arrive on the East River and also take to the podium. He will be absolutely stoned. 95 minutes. Or rather rambling incoherently for 96 minutes, yes, one hour and 36 minutes until he shuffled down from the rostrum. No one interrupted him, and certainly not the president of the assembly. Who is Dr. Ali Abdussalam Treki, delegated by Gaddafi as Libya's candidate and elected by acclamation, by acclamation, mind you, in June of this year. Maybe he didn't interrupt his master's speech because he has children in the home country. (According to the Miami Herald, this was far from the record of the longest U.N. speech. Castro spoke for four and a half hours in 1960; in 1957, the foreign minister of India, V.K. Krishna Menon, delivered an eight hour address defending his country's possession of Kashmir.) 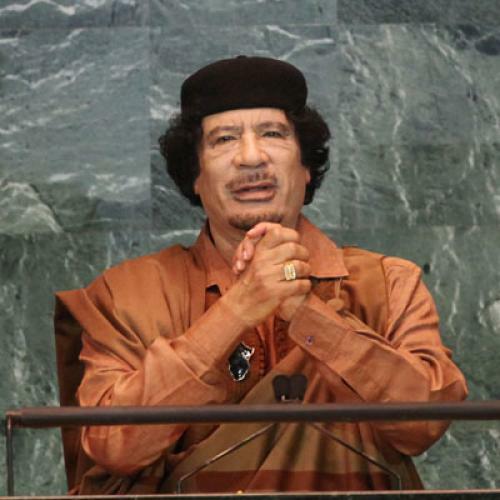 The Libyan head man was tender to Obama, terming him "our son." I hope the president doesn't have any more bad dreams from his father. Dr. A'jad's talk was mostly about the iniquities of capitalism and Zionism. But he did not mention nuclear weapons (more on this later) or the Holocaust that wasn't. The U.N. is a joke. If it weren't in New York no one would come. As an instrument of peace it fails every time. At its best, it is mostly charade, like Ban Ki-moon designating Bill Clinton as the organization's special envoy to Haiti. "Special envoy," my foot. But Susan Rice seems to feel at home at the United Nations. "Google" her and read any of her nonsense about the organization. Any of it. If you don't laugh you'll cry. Either way your response will be appropriate. The president chaired a session of the Security Council, "unprecedented," "blah, blah...". The Council voted unanimously to begin universal disarmament in nuclear weapons. Sure. A unanimous council means something of which the New York Times will approve. It also means that nothing will happen.